In addition to calcium, one of the main nutrients associated with osteopenia and osteoporosis is vitamin D. Although these two nutrients are very important to bone health it is essential to remember that other vitamins and minerals, especially vitamin K, magnesium, and zinc are required to maintain healthy bones. Vitamin D itself is very important as it plays a role in supporting and regulating bone growth, regulates calcium levels, and is involved in the absorption of calcium into the bone. An additional secondary benefit of Vitamin D for osteoporosis sufferers is that it helps to improve muscle function, which in turn can help with balance issues, and therefore can lower the incidence of fragility fractures. Although vitamin D is naturally present in some foods such as salmon and oysters, and fortified into others such as dairy products , it is very difficult to get an adequate amount of the vitamin from dietary sources alone. Fortunately, food is not the main source for vitamin D as humans are able to synthesize it in their skin. This process requires sunlight, and most people living in sunny areas are able to synthesize adequate quantities of vitamin D upon five to sixty minutes of exposure to sunlight (depending upon skin type and season). However, many people do not have access to sufficient year-long amounts of sunlight–especially people living at high latitudes, or working indoors–making it necessary for people living in these areas to take vitamin D supplements; this is especially important in the winter months. As far as human health is concerned, there are two main dietary types of this fat-soluble Vitamin: D2 and D3. The first form is known as ergocalciferol, and the latter cholecalciferol. These two types of the vitamin differ from the other forms as they can be digested by the body (whether they come from dietary sources or through vitamin supplementation). Once these vitamin D vitamers reach the liver they are converted into calcidiol/calcifediol (INN). This can then be converted into the active vitamin D form, calcitriol, by the kidneys. In the form of calcitriol, vitamin D is taken up by the body’s blood system and acts as an hormone, and one of its main functions involves bone growth through roles in the bone remodeling system. Other functions of vitamin D in the blood stream that have an impact on bone health are the regulation of calcium and phosphorous levels in the blood. In addition to the calcitriol that is produced in the kidney for release into the bloodstream, some calcitriol is also produced outside the kidneys, where it plays a role in many biological functions including cell differentiation and neuromuscular function. With regards to bone health, one of the most important functions of vitamin D is in the role that it plays to enhance dietary calcium absorption in the intestine, the efficiency of this process can be reduced by over 50% when adequate supplies of the vitamin D are not present. How does sunlight enable the body to create vitamin D? Unlike, other organic chemicals that are essential for human health–and especially bone health–vitamin D is not a true vitamin because it can be manufactured by the body’s own mechanisms in the skin. As mentioned previously there are two main forms of this vitamin that are used in the body: D2 and D3, it is the latter that is created in the skin through the conversion of a cholesterol (7-dehydrocholesterol). This process requires energy, which it acquires from sunlight in the form of UV-B. This process of converting 7-dehydrocholesterol contained in the skin to vitamin D is extremely efficient, and depending upon the light quality, it can take as little as five minutes of exposure to UV-B on a bright sunny day to synthesize enough vitamin D for a full day. Unfortunately, not everyone is able to get yearlong exposure to the sun; this is especially the case in people who work long-hours indoors or live in areas of high latitudes (above 37° N, or below 37° S), where bad weather and low light quality occurs in the winter. At this time of year, because the sun is not so strong, it may require up to three hours of being outdoors to be exposed to enough sunlight to convert the required vitamin D for daily needs. In areas of extreme cold and/or bad weather this is unfeasible, and people may go for weeks without sufficient exposure to sunlight. This can lead to a deficiency in vitamin D, and in turn – largely due to the vitamins role in the intestinal absorption of calcium – lead to serious calcium related bone related problems such as rickets (in children), osteomalacia, osteopenia, and osteoporosis. Skin pigmentation has a serious impact upon vitamin D production in the skin. It has been reported that people with darker skin may synthesize the vitamin up to 90% less efficiently than people with lighter skin. It is therefore necessary for people with dark skin to spend more time outdoors or to take vitamin D supplementation to ensure that they get adequate supplies to maintain bone health mechanisms. For example, in certain areas of Australia in the winter a person with dark skin may require up to three hours of exposure to sunlight to get enough UV-B whereas a lighter skinned person would need just 30 minutes. Even in the summer, a person with very dark skin will typically require three-fold the exposure to sunlight (typically 15 min compared to 5 min). Calcium plays many essential roles in the body and it is important that the mineral is available at adequate quantities in the blood stream. In the presence of vitamin D (and sufficient calcium), the body is able to absorb calcium in the intestines, and typically the bio-availability of dietary calcium is 30–40%. However, when vitamin D is not present at sufficient amounts for correct functioning of this process then the efficiency of calcium absorption can drop to just 10–15%. The availability of calcium is essential for many biological processes and the body will act to maintain the calcium balance in the blood stream at the correct levels. As it can no longer get ample calcium from the intestine, it will turn to calcium reserves locked up in the skeleton. The removal of this calcium will in in turn will lead to losses in bone quantity and quality. It is therefore essential to have adequate supplies of both vitamin D and calcium (amongst others) to maintain bone health and to prevent conditions such as osteopenia and osteoporosis. There has been much research into osteoporosis and vitamin D. One of the largest studies to take a look at vitamin D levels in people with osteoporosis involved 2,600 post-menopausal women. It was found that of these 64% had levels of serum 25-hydroxyvitamin below 30 ng/mL, which is lower than recommended to prevent conditions related to bone health. This finding suggests that many the majority of women with osteoporosis are not getting an adequate amount of vitamin D.
Further to this, a study of 72,000 women, which took place over eighteen years, revealed that postmenopausal women who consumed a minimum of 600 IU of vitamin D per day had a 37% lower hip fracture incidence rate than postmenopausal women who consumed less than 140 IU. What was particularly interesting about this is that the researchers found that the consumption of milk and other calcium rich foods in the diet alone did not reduce the risk of hip fractures and that adequate vitamin D levels are essential for the prevention of osteoporotic hip fractures by increased calcium consumption. Much research has reported that there is a threshold level of vitamin D required to prevent osteoporosis in both men and women. A paper by Bischoff-Ferrari et al. (2005) revealed that people taking a daily oral vitamin D supplementation of 800 IU had a twenty-six percent lower incidence of hip fracture than those who took 400 IU per day. Furthermore, there was a twenty-three percent lower incidence of non-vertebral fractures under the same conditions. The table below gives the RDA for vitamin D as set by the FNB. Many medical experts feel that these levels are set too low, and that they may not maintain levels of serum 25-hydroxyvitamin D necessary to prevent diseases. It has been recommended by the Linus Pauling institute that healthy adults take a daily vitamin D supplement of 50 µg (2000 IU) to aid prevention of conditions such as osteoporosis. Unfortunately not many foods are naturally rich in vitamin D. Fatty fishes such as mackerel and salmon being the best natural sources of the vitamin. As adequate supplies of this vitamin are necessary to prevent many diseases and conditions, the governments of many countries have introduced legislation to fortify many food products, especially dairy products, margarines, fruit juices, eggs, and cereals. 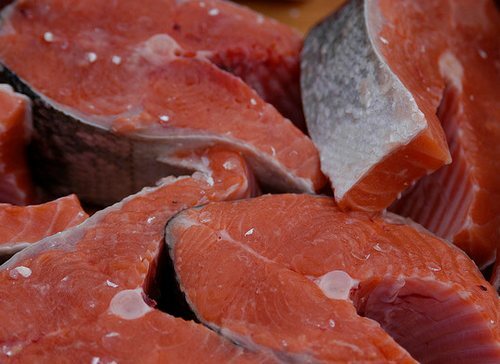 Oily foods such as salmon and mackerel are one of the few sources of naturally occurring vitamin D. Photograph by Andrea Pokrzywinski. Other than the sun related effects (such as living at high latitudes and having dark skin) there are many other risk-factors that may lead to deficiencies in vitamin D. These include (but are not limited to) obesity, ageing, complete covering of exposed skin, over-use of sunscreen, and Crohn’s disease, liver disease, and cystic fibrosis. Given the impact that the vitamin has on bone quality it is essential that people who are unable to gain enough vitamin D through natural synthesis or from the consumption–of the somewhat limited–vitamin D rich foods take a vitamin supplement. Presently, the Linus Pauling institute is recommending that healthy adults take a daily 50 µg (2000 IU) vitamin D supplement. Current research strongly suggests that ergocalciferol (D2) does not effectively prevent fractures, so ensure that you take vitamin D3 supplements if you are aiming to prevent/or control osteoporosis. It is noteworthy that many multi-vitamins have only 400 IU of vitamin D, it may therefore be necessary to take single dose, or specialized calcium and vitamin D supplementations to ensure an adequate supply of the vitamin. The aim should be to maintain 25-hydroxyvitamin D levels at above 32 ng per milliliter. This level has been shown to be effective in the reduction of bone fractures, and of other non-bone related conditions such as diabetes, cancer, and multiple sclerosis. Vitamin D toxicity can occur at levels in people who take have more than a 50,000 IU daily intake, and side-effects can include bone-loss, organ calcification, and kidney stones. Such vitamin D levels are very unlikely to occur in healthy people following normal lifestyles, and toxicity through vitamin D being produced in the skin has not been reported. The FDA has set the tolerable upper level for vitamin D to 100 µg (4000 IU) for adults. There are two main forms of vitamin D that can be digested in the body, these are ergocalciferol (D2) and cholecalciferol (D3). It is not a true vitamin because it can be synthesized by the body via the skin upon exposure to UV-B. Unfortunately, many people, especially those living at high latitudes do not get an adequate supply of vitamin D.
One of the main roles of vitamin D with relation to bone health is in the process of calcium absorption in the intestine. If vitamin D is not present in sufficient amounts then the body cannot absorb dietary calcium at adequate amounts to maintain calcium balance in the blood. As calcium is essential for many bodily functions, the body will remove calcium from its reserves in the skeleton. This leads to a losses of bone quantity and quality and can have serious impacts upon bone health. The D3 form of the vitamin (cholecalciferol) is much more efficient than the D2 vitamer and only this form should be taken as a supplement. Research has demonstrated that calcium supplementation is ineffective against osteoporosis unless 800 IU of vitamin D is also available. For adults the daily recommended allowance for vitamin D is set by the FNB at 20 µg (800 IU) per day for adults. Many medical professionals and researchers feel that this amount is too low to maintain sufficient 25-hydroxyvitamin D levels (ideally above 32 ng/ml) and the Linus Pauling recommends a daily supplementation of 50 µg (2000 IU) to maintain bone health.